Keighley Mayor Councillor Graham Mitchell, right, and Keighley Town Council, Watch and Transport committee chair Councillor Michael Westerman, left, present the certificate for outstanding achievement to Keighley & Worth Valley Railway Chairman, Dr. Matthew Stroh, centre, with volunteers, from left, Robert Paterson, Graham Bloom and Operating Company Chairman, Mike Curtis. 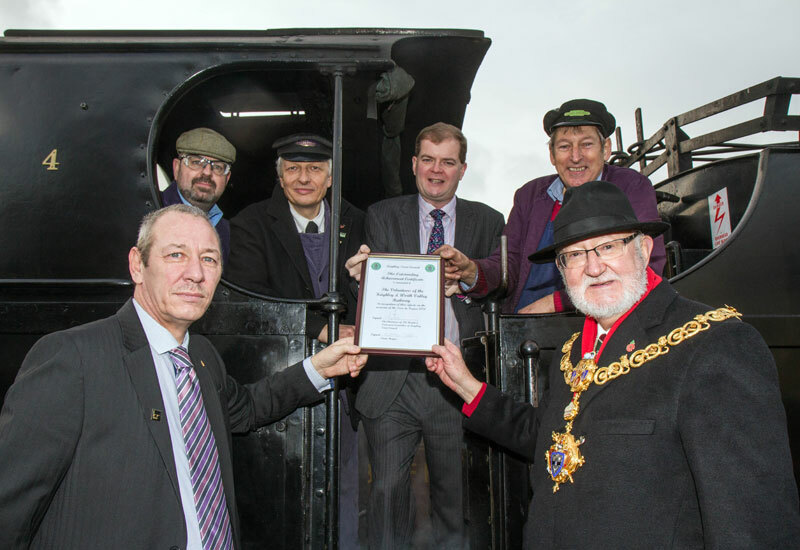 The last day of 2014 was a red letter day for the Keighley & Worth Valley Railway when the ‘Significant Achievement Award’ announced on News@KWVR on the 28th December was presented to Society Chairman, Dr. Matthew Stroh by Keighley Town Mayor and KWVR stalwart, Graham Mitchell. 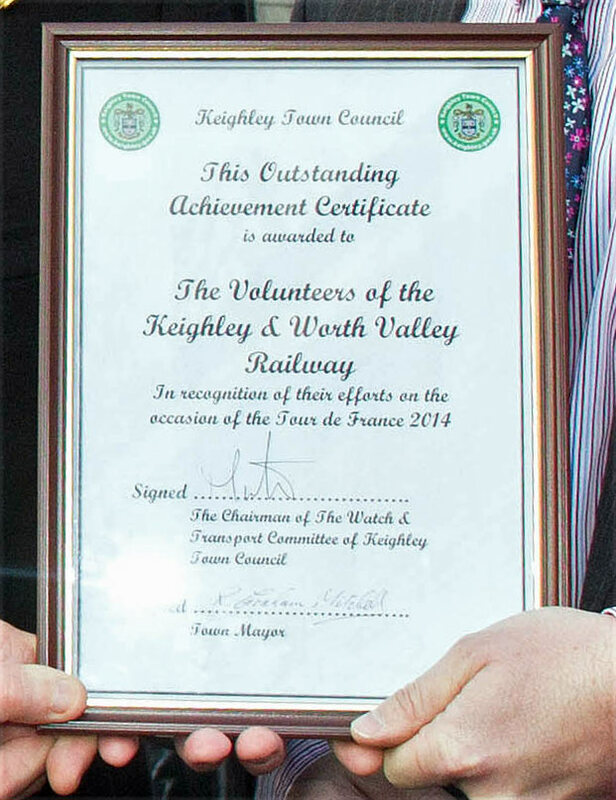 The certificate was presented in recognition of the outstanding achievement of the Railway in moving thousands of passengers up and down the Worth Valley on the day of the Tour de France, when there was no other public transport between Keighley, Haworth and Oxenhope. Keighley Town Council had rather expected that tourism organisation ‘Welcome to Yorkshire’ might have recognised the Railway’s achievement, but, failing that, the Council decided that the year should not end without marking the significant achievement of the Railway volunteers on duty that day.